Rediff – India captain Virat Kohli strengthened his position at the top of International Cricket Council ODI rankings for batsmen by touching a career-high 911 points, while Kuldeep Yadav broke into the top-10 of the bowlers’ chart at sixth, on Wednesday. 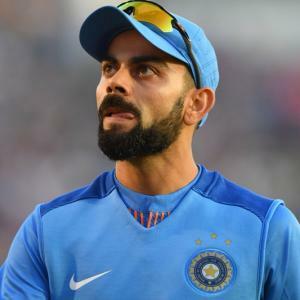 India captain Virat Kohli strengthened his position at the top of International Cricket Council ODI rankings for batsmen by touching a career-high 911 points, while Kuldeep Yadav broke into the top-10 of the bowlers’ chart at sixth, on Wednesday. Yadav is the second India bowler to feature in the top-10 after number-one ranked Jasprit Bumrah and the fifth spinner to find a place in the 10 highest-ranked bowlers. England batsman Joe Root’s back-to-back centuries have helped him vault into second place in the rankings list. Root has leapfrogged Babar Azam (Pakistan), Rohit Sharma (India), David Warner (Australia) and Ross Taylor (New Zealand) to a career-high second position. England pacer Liam Plunkett, has gained one place and is now 20th, Mark Wood is on a career-high 26th ranking after rising two places and David Willey has jumped 11 places to claim 31st positionThere is no change in the top five all-rounders, with Bangladesh’s Shakib Al Hasan leading the field.